Slowhand's first full-length holiday album will arrive on October 12. The album—Slowhand's first full-length foray into holiday music—will arrive October 12 via Bushbranch/Surfdog. It's the legendary guitarist's first album since 2016's I Still Do. Happy Xmas was co-produced by Clapton with Simon Climie. You can check out its Clapton-designed cover art and tracklist below. 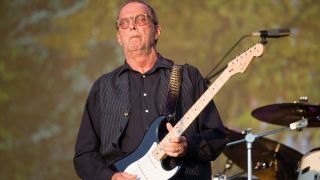 For more on Clapton, point your browser over to ericclapton.com.